Is a “Bad Bank” Model the Solution to Greece’s Credit Crunch? 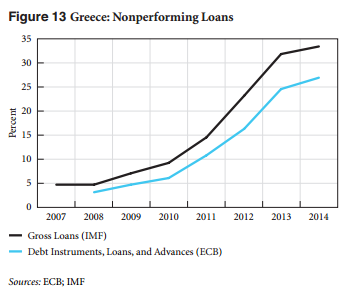 Dimitri Papadimitriou and new Levy Institute Research Associate Emilios Avgouleas write about one of the obstacles to recovery of the Greek economy: the absence of credit expansion in connection with still-troubled Greek banks. The decision by creditors to allow the old, now minority, shareholders and incumbent management to retain effective control of Greek banks is highly questionable. This rather unusual governance approach in a post-rescue period meant that the Greek banking system did not benefit from any cleanup efforts, especially in light of the interlocking and privileged relationships some bankers enjoy with Greek political, media, and economic interests. In order to clear the way for Greek banks to return to making loans, Avgouleas and Papadimitriou propose the creation of a “bad bank” that would take on the NPLs, with government guarantees currently extended to Greek banks withdrawn and applied instead to the bad bank fund. Under this scheme, Greek borrowers would be offered an effective way to restructure their borderline loans while banks could avoid writing off all NPLs, with significant consequences for their balance sheets, and instead have the loans objectively valued and transferred to the bad bank. In addition, creditors would not have to face an unduly inflated Greek bank rescue bill, and the investment that Greek taxpayers have made and will make in the banking sector would not be entirely wiped out. Sound bank recapitalization with concurrent avoidance of any creditor bail-in—which under the current circumstances would prove catastrophic—and implementation of robust and sensible corporate governance changes could help the Greek banking sector return to financial health. The complete analysis can be found in their newly released policy note (pdf).